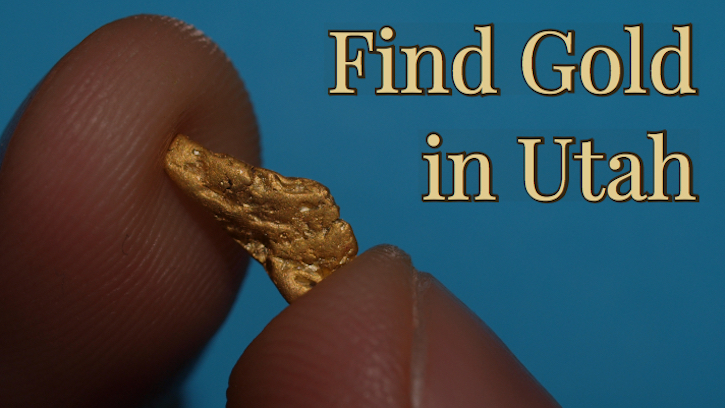 While Utah does not have extensive gold prospecting opportunities like many other western states, there are still plenty of places that you can find gold though. You just have to do diligent research and realize that there aren't as many places to mine compared to neighboring states. Surprisingly to some, Utah is actually one of the top gold producing states, but most of this gold comes as a byproduct of silver, lead, copper, and zinc mining. In fact, the largest mine in the United States is located right here in Utah. The Bingham Canyon Copper Mine near Salt Lake City is by far the largest producer in the state. A handful of other large commercial mines also produce significant amounts of gold as well, resulting in significant overall production for the state. These mines are responsible for 99% of the total gold that gets recovered an an annual basis. Most placer discoveries throughout history in Utah resulted in minimal recoveries, as much of the gold was extremely fine, and not in significant quantities to warrant much attention from the early miners. Much more attention was given to other minerals, but production requires significant money, and cyanide leaching techniques that are out of reach for most recreational prospectors. Still, there are plenty of creeks and rivers throughout the state that yield gold. 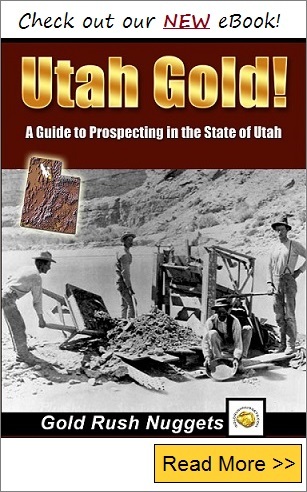 Since the gold in Utah is generally very fine, it is important to be careful when panning, or gold can easily be lost. If there is enough water you can run a sluice box which will help you process more material, but in much of the state you will have a hard time finding any water at all. There are thousands of old hard rock mines and prospects throughout Utah that produced some gold as byproducts of silver, lead, zinc, etc. Creeks and rivers near these mines always have potential to produce some gold for a placer miner, but many have had little reported about them due to lack of any significant concentrations. A few areas that have documented placer workings are listed below. The general area southwest of Salt Lake City has fine gold in the creeks near the Bingham Mine in the Oquirrh Mountains. In addition to lode mining, many placers have been exploited in this area. Johnson Creek and Recapture Creeks in the Abajo Mountains. 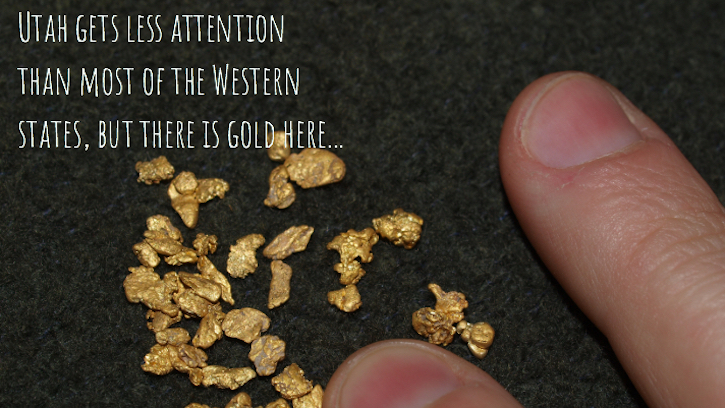 Gold has been found in the Colorado River, but it is extremely fine and requires great care to recover it. A man could probably make his fortune from all the gold in this river, but each speck is so tiny that they are worth a fraction of a cent. It takes a lot of tiny specks of gold dust to amount to much money. In the northeast corner of the state, the Green River has produced fine placer gold below Flaming Gorge Reservoir. Several creeks draining the Henry Mountains in Southeastern Utah. The San Juan River in the southwest part of the state has fine placer deposits. Keep in mind that the lack of water in much of the state limits the extent of exploration, and it is quite possible that significant discoveries are yet to be found. The vast expanse of the mineral resources throughout the state means that there are almost limitless areas worthy of investigation, but gold recovery may be difficult with the lack of water. In addition, the extreme fineness of the gold found can make capturing the gold very difficult as well. A skilled gold panner can still catch some of this gold, but be careful because it is easily lost. One great thing about Utah is that it has an abundance of public land that is still wide open for recreational prospecting. No permit is required for non-motorized methods such as panning, sluicing, or drywashing. Suction dredges are limited to 4” in diameter and have seasonal limitations as well. Contact the Utah Division of Water Rights for additional information.